A while ago, I posted about a Raven Guard Scout squad and what I've learned from a few months of consistent painting. Turns out, I've got a Tactical squad to try my hand at now. Nothing fancy, just your basic Assault on Black Reach models. 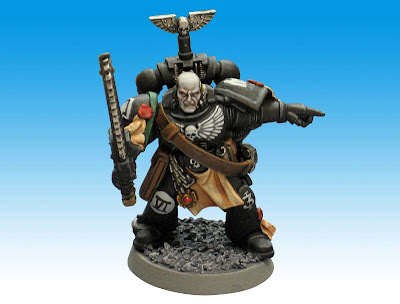 For the Sergeant model, I was asked if I could add a bolter to him slung over his shoulder. Sure, no problem I thought. Turns out, that little project is a bit harder than it looks if you want to do it right. In the end though, it paid off, the finished model doesn't look half bad and the minor conversion is completely believable. A little strip of plasticard and some greenstuff "straps" were all it took to get a real close representation of what the other models have. That and I needed to greenstuff the trim on his right shoulder pad since it wasn't there and wouldn't you know it... that's the one piece of armour they paint to show what unit they are. With a little bit of freehand, the paintjob is complete. 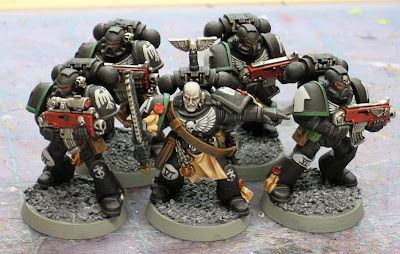 Seeing the same muted scheme I used on the Scouts transferred over to a Tactical marine has me excited to see how the rest of the squad turns out. Here's the first half of the squad so far. I never realised how difficult it can be to pull off a "good" black armour paint scheme. With black, it's not the armour color that makes the model, it's all the other details. With armour that is another color, you can work on it (the armour color) and it can carry the paintjob to a degree. With black, you've got nothing and you're relying on all those other details to really make the model look alive. Maybe that's why people think "black armour" is so tough, it's not the armour... it's everything else you need to paint really well. And to top it all off, this is my first time painting a bolter red so that's been completely new for me. I've gone back and added the complete squad above, you can click on the image for a larger version. Do you mind sharing how you got that pale skin tone? Always love those "Well that seems simple enough..." projects that end up being harder than expected. Of course that's what keeps the hobby fun. Turned out very nice. Rushputin: Sure, I'll put something together and post it later this week. Ron the painting is nice as always but I have to say I am not a fan of the strap. It does not wrap around the contour of the shoulder and chest like a strap like that should and looks a bit stiff instead of like the flexible leather strap it should. This is do to the rigid nature of the plastic card. Personally I would have used GS for the strap as it would have allowed you to make it fit more snug against the body with less of the bow you are getting with the plastic card and I think would have looked more natural. Just something to think about for future projects. Again the paint looks fantastic. HuronBH: You make a good point. The effect (the bowing) isn't as pronouned on the actual model when you look at it. It was much worse when I started. 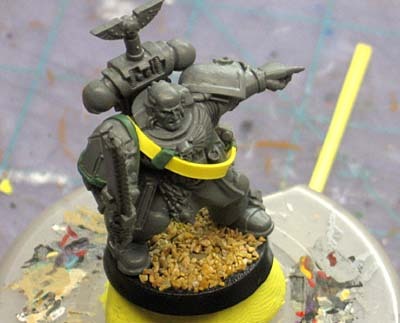 I tried GS as my first attempt but found it hard to work with when it came to making it look like it was holding the weight of the bolter... it looked more like a sash and not a sling. This was the better of the two options for me. Ron, looks nice I too would like to see this demo on pale flesh. I have some models coming up that I need to figure out how to do a similar flesh tone to. The pale flesh effect and shadowing is quite spectacular.